Dress up your living room with round floor pillows to add comfort to home interior. They are appropriate for small parties, dinner parties and unexpected guests. 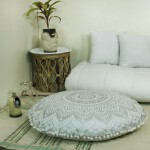 Our collections of floor cushions are perfect for casual seating, a cozy nook or meditation. 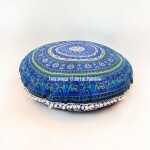 Our poufs, floor seating cushions are handcrafted by Indian artisans which is great addition to any home. They come into intricate designs they add boho looks to home. Our pouf ottomans and floor seating are luxurious, comfortable and best known for stylish living. The intricate design pouf is a most classic and looks great with any style of decor and high enough off the ground to almost be a stool.